Divide By One: "you guys ever heard of a job?" "you guys ever heard of a job?" 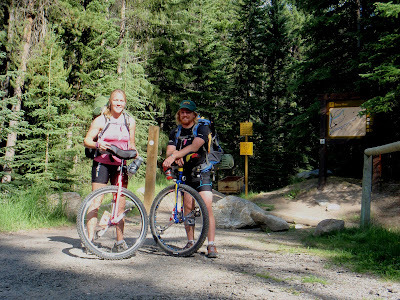 a couple of days before beginning the journey south, as we were coming off the trail after the practice run-through, we arrived back at the trailhead to find three mountain bikers, loaded with gear and posing for a picture. the father of one of the cyclists was dropping them off to begin their bicycle journey down the great divide, the same route we are riding. after the bikers took off, matt and i chatted for a bit with the father, whose reaction to our journey was (and i quote), "you guys ever heard of a job?" i don't want to know what kind of battle the son fought to convince his dad that biking all summer was worthwhile. maybe someday that father will relate to the joys of the wonderful dichotomy we describe in four 4-letter words: work hard, play hard. meanwhile, greetings from Elkfordshire, a town known to most as Elkford, British Columbia. 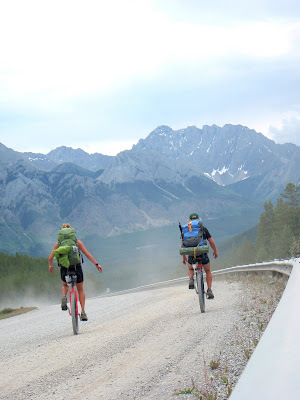 we left Banff on july 2, eager to roll away from the beautiful town whose streets and sidewalks were filled with bike-salmoners. the morning after re-entering The Real World, on our second day of riding, we treated ourselves to a breakfast of some lychee nuts that i had been carrying around for many days. those, in combination with questionable bison pepperoni, caused matt to experience the wonders of both gastrointestinal destruction and a severe allergic reaction simultaneously. 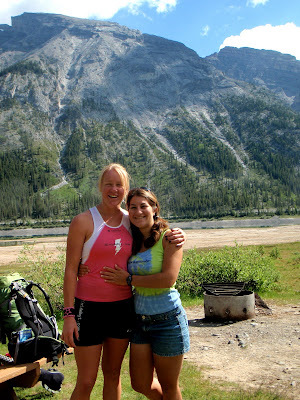 after the itching, redness, puffiness, hives, chills, and other liquids had passed, my friend meredith (weekend warrior princess) caught up with us during her weekend trip to Banff, and blessed us with her company. even though only one day out on the trail, it is refreshing to see a familiar face, and matt was a good sport by pushing through challenging days with little more than a destroyed internal system. 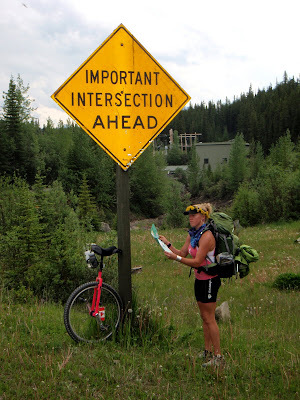 one great thing about being out on the road is that we cross paths with many others who are on their adventures. 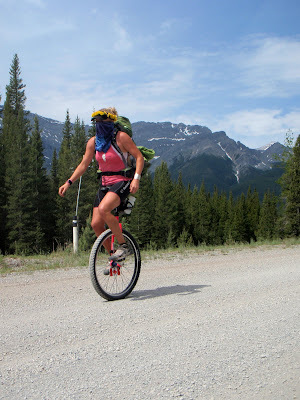 if you think cycling across the country is a crazy endeavor, i recommend trying it and you will find a surprising amount of people doing even crazier things. 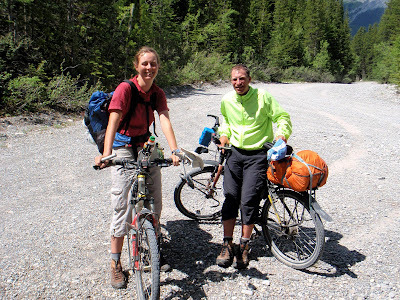 [martin & nadine have been cycling around the world since 2003.
much of the route takes us along dirt or gravel roads, which can get very dusty on dry days with car traffic as we near towns. the dust the cars kick up can make it very difficult to breathe and see. after donning a handmade crown of dandelions (the roads are lined with them), i coped with the dust by combining my visor and bandana to block the dust, looking more like a dandelion bandita. i call the style, "dandi bandi" - it's all the rage in the mountains. although my backpack started out at 29 pounds, it is notably lighter now, with less food; our trip started out with a 3-day food carry until our resupply at the Boulton Creek Trading Post in the Peter Lougheed Provincial Park of Alberta. 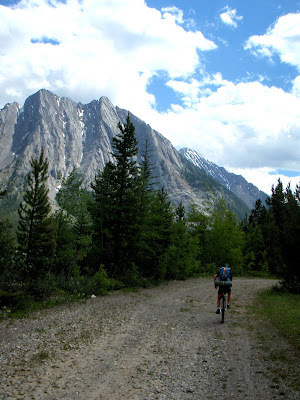 mostly, our route has been trail and dirt roads, each bringing their own challenges. 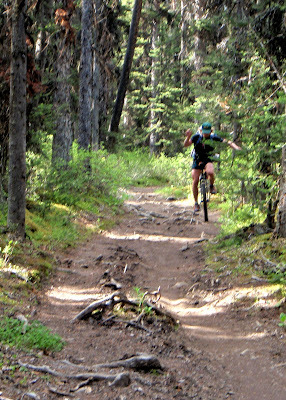 we found the brief section of paved bike trail near the trading post nearly more difficult than off-road, due to the increased responsiveness and squirreliness of our unicycles. the route has challenged us as our bodies adjust to the demands. the more extreme terrain evokes surprising route instructions, such as "walking recommended," and "start climbing a virtual wall." 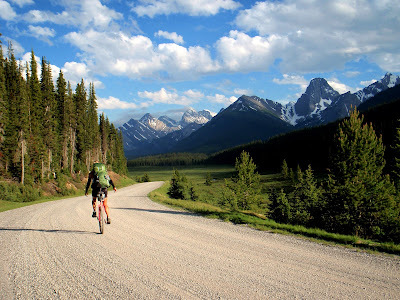 we have had to walk up a handful of the steeper sections, but found the strength to ride up nearly the entire long-haul to the top of elk pass (6,443'), our first of 28 continental divide crossings. 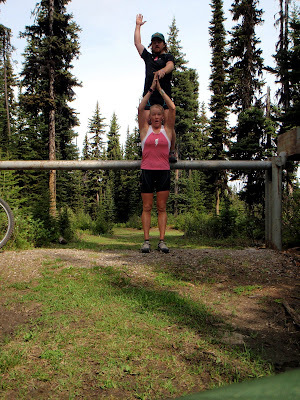 [matt and i at the top of elk pass, forming a "1," representing our first divide crossing. - they like to tax... everything. even your $1 per hour internet usage is taxed. - hotels and restaurants are surprisingly expensive. 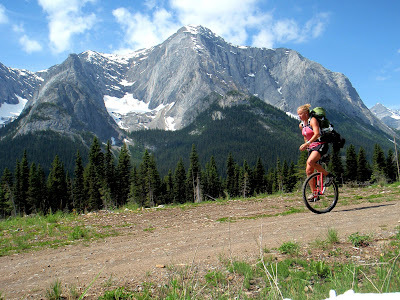 - when two people ride unicycles in the middle of nowhere on a dirt road that is approximately 20 METRES wide, "conservation officers" in pick-up trucks will ask you to ride single-file, "for your own safety." what i gather is this: canada taxes people so that they can pay other people to drive around and "conserve" other people's lives. i thought it was only the U.S. that took strides against personal freedoms by making & enforcing laws against endangering oneself. alas. at the boulton creek trading post, we stuffed our faces appropriately, even gobbling down broccoli-cheddar soup that looked less like soup and more like inner thigh fat, especially after it congealed. it's no wonder the mosquitoes hounded us that night - worse than i had ever experienced. inside the tent, i beat them at an unfriendly game of "mosquito rodeo." other treats along the route include countless meadows full of dandelions, and various pieces of abandoned equipment, such as gloves, jackets, a backpack, and 20 horses. no joke. and oh, the storms. i am a huge fan of weather in general, so i had a great time during a day of solid rain, which came just minutes after leaving the campsite for the day. 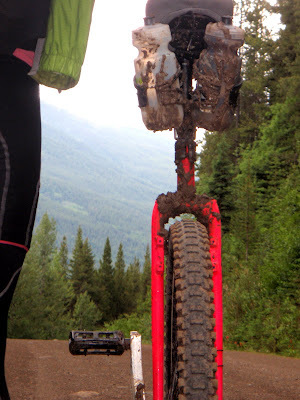 it kept coming well into the evening, turning the road into more of a stream, and caking my unicycle with mud. bits of mud would fly off every which way as the wheel spun, and we got soaked to the bone. i had a blast! 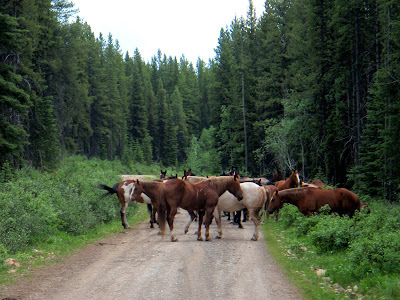 intermittently, we come across cattle guards, ones that are far more treacherous than most we had seen in the U.S. canadian cowboys don't mess around. we found ourselves thinking of them more as unicycle guards, or unicyclist guards, for that matter. we hereby officially commence the 2009 Comeback Contest, accepting ideas for how we should respond to the ever-present/never-funny-to-us "you're missing a wheel!" 1. "Where's your other wheel?".... 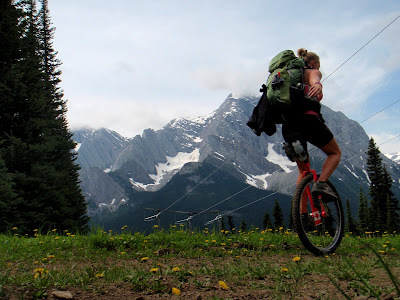 "On my other unicycle". 2. "You're missing a wheel"..."I got rid of the training wheel". 3. 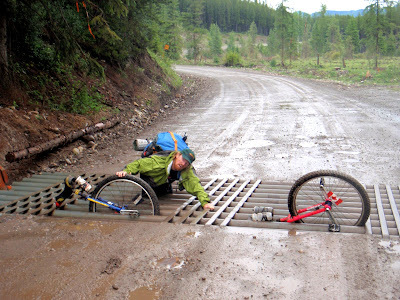 "Hey you're missing a (wheel, other half of your bike, etc.)"... "I seem to be getting along fine without it". Unfortunate to hear that Canada is turning out to be America Lite, hopefully you'll have better luck in future days. Oh Man! I forgot it AGAIN!!! "Your mom's missing a wheel." "We're minimizing our environmental wheel-print." Q: Where is the rest? Why don't you have a regular bike? A: Riding a bike makes me two/too tired! 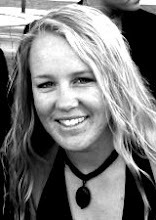 THANKS for the time you take to update us--we are following you and thinking of you especially as you climb those many divide crossings! It is a stretch for me to atgtempt it (next year) with double the wheels! Hang in there! Beautiful, I am soo happy you're both off, well done, I get to live vicariously through another adventure. keep the updates coming please!!! its good to hear its going well and tell those chumps with 2 wheels NOTHING cuz those panzys dont deserve a the breath it takes! Shiloh kinda stole mine, i was just gonna say "your mom"